As we’ve said many times before, we’re big fans of music-for-a-cause type situations. When causes we believe in join forces with bands whose tunes hit our ears favorably, more often than not, we’re going to recommend that show to you as well. Today’s even better as we’re fortunate enough to combine our love of gigs for good (or Gigs4Good if you prefer) with our love of giving away tickets to good gigs. 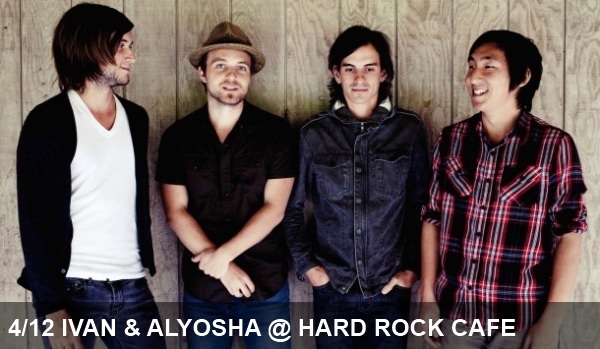 We’re thrilled to be able to offer you a chance to see Ivan & Alyosha and the rest of the Gigs4Good lineup at the Hard Rock this Thursday. For a chance to win a pair of tickets, just send an email to SEAliveMUSIC [at] gmail.com with the subject line “You’re On To Something” by noon this Thursday. Team Up For Nonprofits, an up-and-coming group that raises much-needed funds for other local non-profits through the intersection of music and socializing (whether in-person events or of the virtual variety), is bringing three excellent local acts together for the benefit at the Hard Rock tomorrow night. Tomorrow’s show will benefit the local volunteering powerhouse Seattle Works. 4/12 (Thursday) – Ivan & Alyosha, Yuni In Taxco, Kevin Long (Gigs4Good Show) @ Hard Rock Cafe, Doors at 7pm, Show at 8 pm, $20 Advance, $10 for students with I.D.